Axis Of Oversteer: BMW M3 GT2: what's new at the office? BMW M3 GT2: what's new at the office? Can you spot the big new thing inside the cockpit of this 2011 BMW M3 GT2? 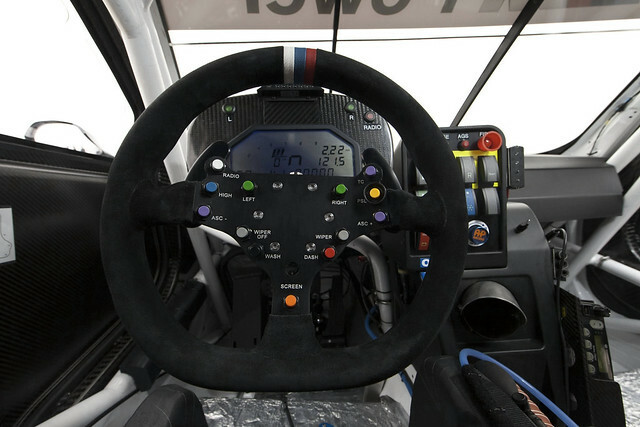 This will be "the office" for BMW's works drivers in ALMS this season and I'm sure you already spotted the new feature: paddle shifters are now allowed by the rules. Gone is the big sequential stick, now the drivers can keep both hands wheel. Check out the roll cage structure forming a loop around the drivers knees, I don't remember noticing that before. Also, note buttons for traction control and "ASC", stability control? differential settings? BMW fans will appreciate the fancy locating mark on the steering wheel, not in the usual yellow but three bands in the traditional ///M stripes.. Guess they couldn't find light blue for the steering wheel ///M stripes, so they went with the Russian flag motif. Who makes the steering wheel?